But, American than I am, I just could not walk on by without attempting some kind of conversation with this stranger in Grandpa’s house! I pleaded with Miloš to talk to him and ask him about the house. The conversation that took place surprised us all. This man lived in one side of the house, and was willing go next door to find the landlord. I stood in amazement, anticipating what we might learn. The landlord, a friendly middle-aged man, approached us and gave us permission to come into the yard. Excitedly I entered the gate and hurried toward the house. In this gentleman’s hand was a large skeleton key. He put it in the door and invited me to go in – INSIDE! I was going INSIDE the Diviš house! 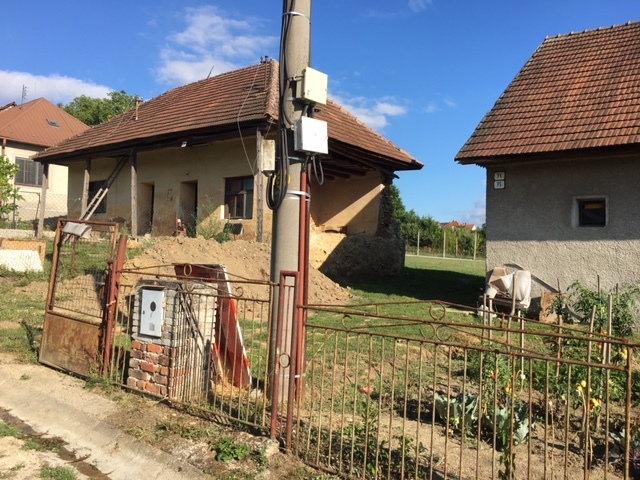 This was a step back into the dream I thought I was living when I first set foot into the small village of Nedašovce in 2015, and then found this house. Then, and now, it was as unbelievable as setting foot on the moon! And now here I was INSIDE! I handed my phone to the girls with instructions to take pictures while I explored and talked with the landlord, who followed me through the door. 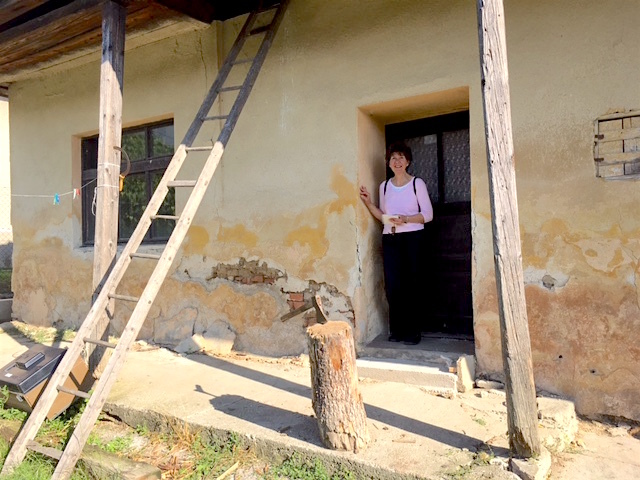 There we were – my adopted family, the owner of the property and me – the first Diviš to set foot in this building for – decades? I wish I knew! The house, I must say, showed its age. It was built in about 1860, we were told. Its current owner thought originally it had been built to be some kind of stable, belonging to a wealthy family. As it was that day, it vaguely resembled a duplex, a room and hallway separating each half. The man we first saw was occupying one side. There were two more buildings, duplex style, to the right of the Diviš house. The current owner explained that he understood all three “duplexes” were connected together to form the stable. At some point in time, they were separated. Now they belong to our new friend. He was very pleasant to us, happy to share what he knew. He even suggested he might be able to locate more history about the house, and took Miloš’s contact information. I wondered if my family ever actually owned this house. Which begs the question: What happened to Grandpa Stefan’s parents and siblings as time passed, wars came and neighboring empires conquered. Diviš family lore suggests that Stefan & Josef’s father, Augustine, was a leather worker, perhaps making horse harnesses? I have few threads to unravel the mystery of Augustine and Anna Natravil Diviš. Miloš had found an entry in the Vysočany church records, a short distance from Nedašovce, with a wedding date of Nov. 9, 1879. Augustine lived a short life, dying in his 30s, from pneumonia, and Anna living into her 70s. But where they lived after Nedašovce and where they are buried remains a mystery. But I digress. Back to THE HOUSE! Stepping through the front door, to the left, one enters into a long hall, perhaps 6 feet wide, leading to a back door going out into a small backyard. Bricks cover a portion of the hallway walls around the back door. A large door to the left of the hall/entrance, leads into one single room — maybe 10’ by 12’. It is in various stages of disrepair, and there are signs that someone is attempting to repair/restore/remodel: lumber piles, debris, a ladder, but no furniture. The walls are partially covered with old, faded, reddish wallpaper, with a floral decorative print. Large areas of bare wood are exposed where the wall paper is missing. The floor is a bare wood. The windows look like they have been replaced at some point, looking newer than the structure itself. While the landlord chats with Miloš, I continue to look around and marvel that I am, indeed, INSIDE! It doesn’t take long to see it all, and soon we all walked back out the front door, taking a few more pictures. We lingered with the landlord, who promised to do research on the original owners. Saying our goodbyes, we resumed our walk down the street, congratulated each other at having achieved this feat of not only finding the owner, but entering into this mysterious house! It is late in the afternoon as we return to the car, and time for us to return to the Krpelans’ residence, a 30-minute drive away. We reviewed our day as we left Nedašovce and counted the blessings of our discoveries and those who helped us along the way. Amazing! We had covered so much ground; it was hard to believe that only one afternoon had passed since we last saw Iveta and Lenka back at their home. A meal was ready for us, stuffed cabbage and chicken, which we quickly devoured. After dinner, we retired to the family room, I as their guest for the night. We would return to school the following morning. Settled on their couch, I tried to absorb the events of our day. Another English school would be over tomorrow, and I would be sad to say goodbye to this precious family. My discoveries of the Diviš heritage will forever be entwined with the Kreplan family. As my thoughts turned sentimental, I was interrupted by five ladies — carrying ONE CAKE and singing a song with a vague resemblance to “Happy Birthday to you,” only in Slovak! I had totally forgotten it was my birthday! My class had sung to me earlier in the day, and someone must have told Iveta & Lenka, who had been busy all afternoon baking a delicious banana cream cake. What a perfect ending to a terrific day — a birthday to remember! Grandpa, thank you for setting me on this journey!